Starring: Gemma Arterton, Martin Compston, Eddie Marsan. The Disappearance of Alice Creed is British writer/director J Blakeson's first feature film. Shot on location in the Isle of Man, with only three characters, its a psychological thriller guaranteed to keep you guessing till the end. 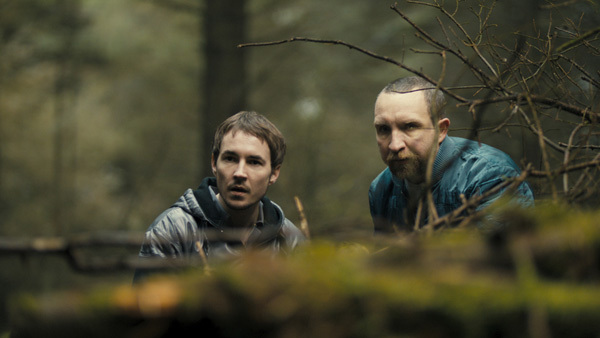 The story starts with two men, twenty-something Danny (Martin Compston) and the older Vic (Eddie Marsan), stealing a van. At a supermarket, they buy a power drill, a mattress, large plastic sheets, and a variety of other items. In a small flat, they methodically go about assembling a bed, and sound proofing the walls and windows. At the appointed time and place, they pull up on a street corner, put on balaclavas, and suddenly grab a young woman, Alice (Gemma Arterton), shoving her into the back of the van. They drive to the flat, where she's stripped, and carefully hand-cuffed to the bed. The men's plan is simple: demand a ransom of £2 Million from the girl's wealthy father in return for her release. What sounds like a simple plot becomes more complicated by the minute, with twists and turns at every corner. Just when you think you figured the next move, think again. With only three protagonists in the film, choosing the right actors would obviously have been a make or break decision for Blakeson, especially for a low-budget film, with an extremely tight shooting schedule. Needless to say Blakeson has succeeded brilliantly; the casting is absolutely perfect. The choice of Scottish-born Compston as the confused and somewhat disturbed Danny is inspired. 2010 has been a big year for Compston, with four completed films, and four others in pre-production. Fresh from his success as John Houseman in Me and Orson Welles, Marsan once again, provides a solid and entirely credible performance as the prone to violence and unpredictable Vic. This acclaimed British actor has gone from strength to strength since his appearance in Martin Scorsese's Gangs of New York (2002). However, it is the feisty Ms. Arterton in the title role who steals every scene. Alice Creed represents a challenging but welcome break for Arterton from her recent roles. After her appearance in Quantum of Solace in 2008, she seemed to be typecast in fantasy/adventure roles, with films such as St Trinian's II: The Legend of Fritton's Gold, Clash of the Titans, and, The Prince of Persia: The Sands of Time; all moderately successful. The Disappearance of Alice Creed is an emotionally charged experience. Above all, it's a highly entertaining film that should please fans of spare, claustrophobic thrillers. For independent filmmaker Blakeson, it's a commendable first effort into feature films, following his previous two short films, Pitch Perfect (2005), and The Appointment (2009). 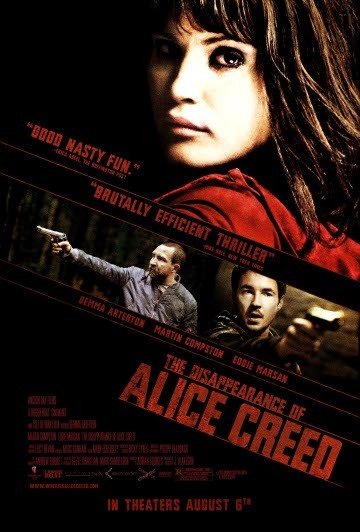 With top notch performances by the cast, beautiful camera work by cinematographer Philipp Blaubach, and 98 minutes of pure suspense, The Disappearance of Alice Creed is a winner.